I am a devoted fan of lamb, and so the annual Lamb Jam is naturally one of my favorite food events. 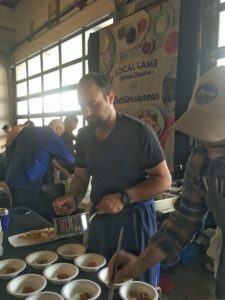 This year’s event, held May 15 at DC’s Union Market was a chance for me- and 400 other lamb devotees- to go wild. Lamb Jam pits local chefs in a competition to cook up the best dish- judged by a panel of food media in a blind tasting. There is also a People’s Choice award. 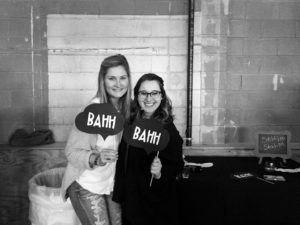 The theme of the event was Global Flavors. 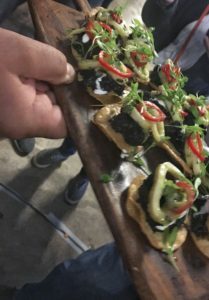 Chefs were divided into categories of Mediterranean, Asian, Latin and Middle Eastern cuisine, with an overall winner selected, as well as a winner in each category. 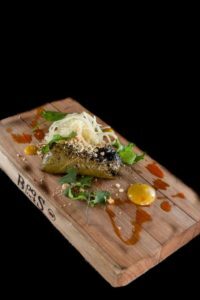 The overall winner was Brasserie Beck Chef Dean Dupuis who served a flavorful creation of charcoal-grilled Vietnamese lamb in grape leaves. He will advance to a national competition in New York later this year. Chef Dupuis also won best Asian dish. For lamb lovers like me, Lamb Jam is paradise. I can’t wait for this event to come baaaack next year. Guests take a break from eating for a photo opp. The American Lamb Board is an industry-funded research and promotions commodity board that represents all sectors of the American Lamb industry including producers, feeders, seed stock producers and processors. The Board, appointed by the Secretary of Agriculture, is focused on increasing demand by promoting the freshness, flavor, nutritional benefits, and culinary versatility of American Lamb. The work of the American Lamb Board is overseen by the U.S. Department of Agriculture and the board’s programs are supported and implemented by the staff in Denver, Colo. The event raises funds for DC Central Kitchen.